Samsung NX30: Can Sammy's Mirrorless Shooters Catch On? The new Samsung NX30 is an improved reboot of the company's NX20, a mirrorless interchangeable-lens camera that took beautiful photos but came with its share of foibles as well. The new camera adds a new autofocus system, and some improved hardware. Samsung's introducing a bunch of new lenses as well. Is it enough to make Samsung's mirrorless cameras catch on? 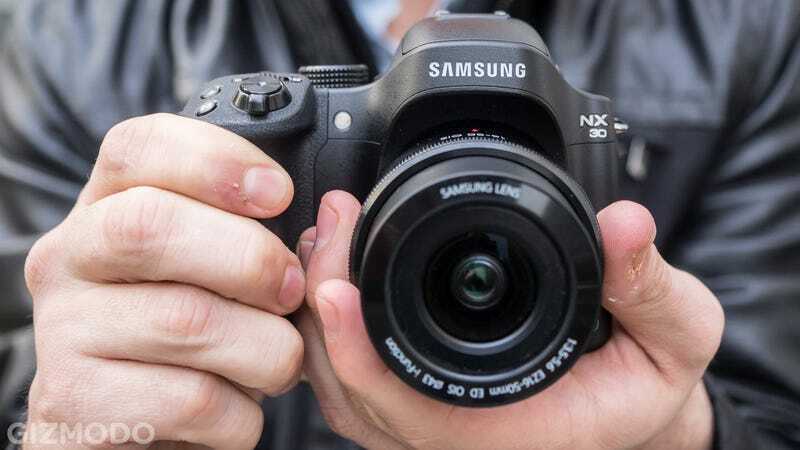 Samsung NX20 Review: Great Photos, But Worth the Money and Irritation? First things first: The NX30 has what Samsung is describing as a slightly improved 20.3-megapixel, APS-C sensor. What's going to make a big difference to shooting is the new hybrid autofocus system that uses both phase-detect and contrast-detect autofocus. The NX30's predecessor was lacking on focus speed and precision, so this is a welcome improvement. The camera's notable hardware improvements include a tiltable electronic viewfinder with 2.36-million dot resolution. There's a new mic input so that you can easily use an external microphone when recording video. There are a number of additions to the camera that have been seen on other cameras before and aren't exactly mindblower: The NX30 shoots 1920 x 1080 videos at up to 60 frames per second. It's got NFC which will make the often clumsy process of Wi-Fi pairing with mobile devices easier. As before, the NX30 is a nice camera, but it doesn't offer a while lot in the way of differentiation for people considering their options, especially when some of Samsung's interchangeable-lens competitors like Sony and Olympus are making outstanding shooters. Samsung hasn't announced pricing and availability for the NX30, but you can expect it to cost about $1100 bundled with a kit lens, just like it's predecessor. That's a tough sell. In addition to the NX30, Samsung is introducing two new lenses. The first the 16-50mm f/3.5-5.6 power zoom lens will be a cheaper lens, which is ultimately destined for kits. That's pictured throughout in the section above. Of greater interest is the 16-50mm f/2-2.8 S-series lens. You've never heard of the Samsung S-series lenses because it's a new line of higher-end, "special" lenses Samsung plans to start rolling out. This is serious, hulking glass that Samsung hopes to use to attract serious photographers—much the way Sony has lured in many people to its mirrorless line with its partnership with Carl Zeiss. If Samsung is going to succeed in making itself a serious competitor in the mirrorless market, it's going to have to convince people to switch, and building up a sick ecosystem of lenses is a smart way to do that. We look forward to seeing what other S-series glass, and hopefully innovative cameras Sammy's got in store for us in 2014. Samsung hasn't announced pricing and availability.